The 145-square-foot-kitchen was part of a whole-house remodel that also included renovating two-and-a-half bathrooms, as well as four remodeled bedrooms and a laundry room. “There was a lot going on,” he says, but incredibly, the entire home project was completed within six months, with the kitchen taking about two months. Even more impressive is that despite the space challenges, the kitchen features virtually everything from he and his wife’s design and product wish list, including space-saving options like IKEA’s MAXIMERA drawers,a peninsula with barstool seating area and a sleek, custom design theme based around IKEA’s SEKTION cabinet frames. While the layout had space constraints, one thing it also had was 9-1/2’ high ceilings which Jason wanted to take advantage of with stacked upper cabinets. Therefore he selected IKEA SEKTION upper – and base – cabinet frames and combined them with Scherr’s Shaker door fronts (https://inspiredkitchendesign.com/shaker-style-door/), painted in a gray called Foggy Day. The cabinets also feature IKEA’s white UTRUSTA shelving, hinges and drawer fronts and IKEA’s FORBATTRA cover strips and fasteners. “Ultimately, this is an IKEA kitchen, we just used custom door fronts to make it look custom,” he says. To complement this IKEA kitchen, Jason opted for a Performer Series 30” range from American Range; a Kraus sink; a stainless steel range hood by Z-Line and a matte black Delta Trinsic kitchen faucet with a matching garbage disposal. Other products include a KitchenAid Refrigerator and a Sharp microwave, which added a unique look as well. “The microwave has custom trim and is made to be hung from the bottom of a cabinet row, so it basically looks like a built-in,” he says. He also had white macabus quartzite custom fabricated and installed for the countertops. 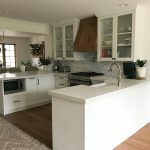 We bought the stone slabs about four months before we had the kitchen installed and the stone yard held them for us until we were ready,” he adds. Completing the product lineup is standard LED recessed can lighting and undercabinet lighting, as well as engineered wood flooring called Fireside Oak, available from Mohawk’s Weathered Vintage Line, which is featured throughout the entire home. Jason selected IKD’s design services because – although he had spent months looking on HOUZZ– he needed proper design guidance. 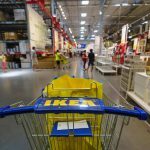 “I wasn’t going to try and take it on myself and use IKEA’s software. I just wanted to turn it over to the experts, which was IKD and Chuck (https://inspiredkitchendesign.com/the-ikd-designers-chuck/). It actually relieved a lot of stress,” he says. That does not mean that there weren’t some compromises and adjustments along the way. For instance, a small four-person 39” round dining table was incorporated into the corner of the living room and used for a dining space. “We basically compromised and went for the bigger kitchen and smaller dining space,” he describes, with the kitchen and living room a combined 345 square feet. We designed completly online with Jason. His kitchen turned out beautifully and we’re happy to be parf of it.